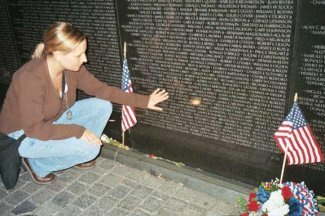 The Vietnam Veterans Memorial in Washington, DC, USA, "The Wall" now has carved into it the names of the 58,260 American military personnel (eight were women) who were direct casualties of the war, including about 1300 who are still considered Missing In Action (MIA). When The Wall was built, there were 57,159 names. A few names have been added each year: those where lost records of wartime death were found later or those names of men who died after the war from physical injuries as a result of the war. THe US Department of Defense established the criteria of geographic boundaries and beginning Each of the branches of the Department of Defense made and continues to make the determinations of eligibility.